After much trial, error, and bad reviews from my pigs, I have finally come up with a hog feeder design that makes both me and the pigs happy. 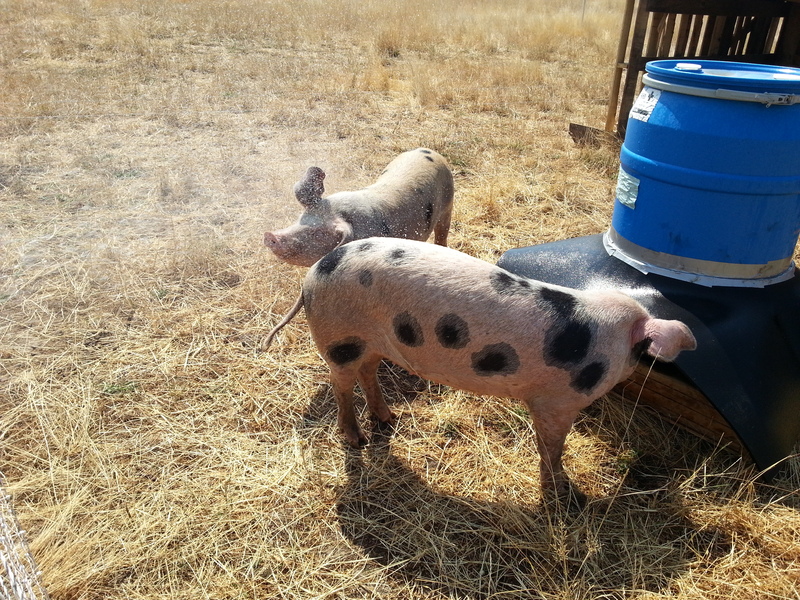 When I raised my first two pigs, I didn’t want to go down to the farm store and pay $150 or more for a feeder with flimsy metal feed covers and a leaky top. I searched around the ag extension office websites on the internet and found plans for one basic type of feeder that I could make out of wood. I built one of those and found that it had a lot of undesirable traits. For instance, the doors were made of wood and my pigs loved to go over to the feeder at midnight, stick their snouts under the lid, and then slam it open against the side of the feeder. They must have really enjoyed that hammer-on-wood sound, because they slammed the lids over and over until I got out of bed and went outside to see what all the racket was about. I tried all sorts of modifications, from putting tennis balls on the side of the feeder to dampen the sound, to adding foam under the lid, so it wouldn’t slam when they pulled their head out. Night after night I was out there fiddling with the feeder with bleary eyes and a headlamp while the pigs snorted and laughed. Another not-so-wonderful trait of that feeder design was the fact that the pigs liked to shovel their feed out of the feeder and onto the dirt. Boo! Feed isn’t cheap and when the feeder was empty, they thought it was a good idea to tip over, throw, and break the feeder to express their displeasure. Lots of spilled feed and repairs later, I set out to build a better feeder. I’m a big fan of making things out of easily-obtained, standard components and as little hardware as possible. My components of choice are pallets, scrap wood, deck screws, and barrels. Black drywall screws are too light for livestock duty: the screws easily snap and the heads twist off. I spend the extra money on deck screws and build everything on the farm with them using a cordless impact screw gun. for a measly $1,278 + shipping. The second is this delightfully simple mineral feeder for cattle . I mashed the two concepts together and using my standard components, came up with my new feeder design, which holds up to 300 lbs of feed and costs about $100 if you have to buy everything and considerably less if you have scrap plywood and lumber lying around. 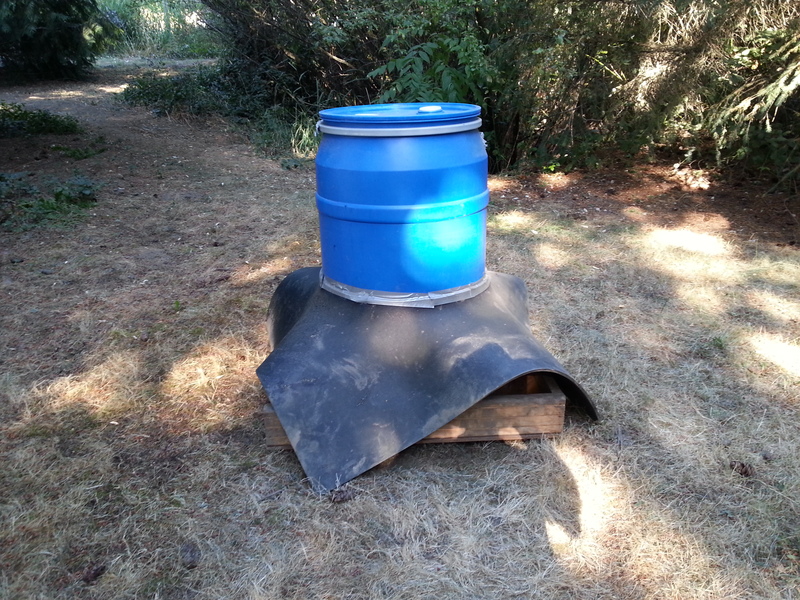 To build this feeder, I start with a food-grade plastic barrel with a removable top ($40) and then cut the bottom out the barrel with a reciprocating saw. Then I cut a sheet of plywood in half for the base (4′ x 4′) and screw on sides made out of 2″ x 6″ lumber. I add 2″ x 6″ cross pieces at the corners to keep the feeder area more or less round and prevent feed from getting trapped in the corners. Then I add four upright braces. The real key to this feeder is that you need to put riser blocks under the barrel so there’s a gap between the plywood base and bottom of the barrel. The gap should be between 1.5″ and 2″ high. No higher and no lower. Too low and the feed won’t come out. Too high and too much feed comes out. You want the feed to just trickle out as the pigs are feeding. Too much feed leads to snout shoveling. Once the riser blocks are in place, I screw the upright braces to the barrel. The last piece is the rain cover made from 3/8″ rubber mat. A 4′ x 4′ piece costs about $40. Using a razor knife, I cut out a circle in the middle, careful to make it smaller than the diameter of the barrel because the rubber mat will stretch and I don’t want gaps between the barrel and the skirt. 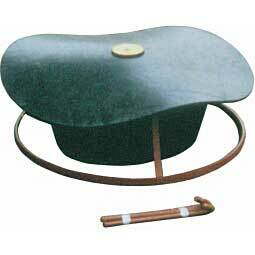 I work the rubber skirt down over the barrel and it rests on top of the upright braces. The feeder is now good enough for three-season use. For winter use, the rain skirt should have any gaps between the skirt and the barrel sealed up. Duct tape works if you don’t mind replacing it every year. I am now experimenting with metal flashing to see how that holds up and keeps the rain out of the gap. So far, I’m really happy with this design. The rain skirt keeps the birds and rain out of the feed. There are no lids to slam and the wide base makes the feeder more difficult for the pigs to tip over (in fact, my pigs haven’t ever tipped this design over). With the 1.5″ to 2″ riser blocks under the barrel, the pigs eat the feed as it trickles out and there’s no waste on the ground. 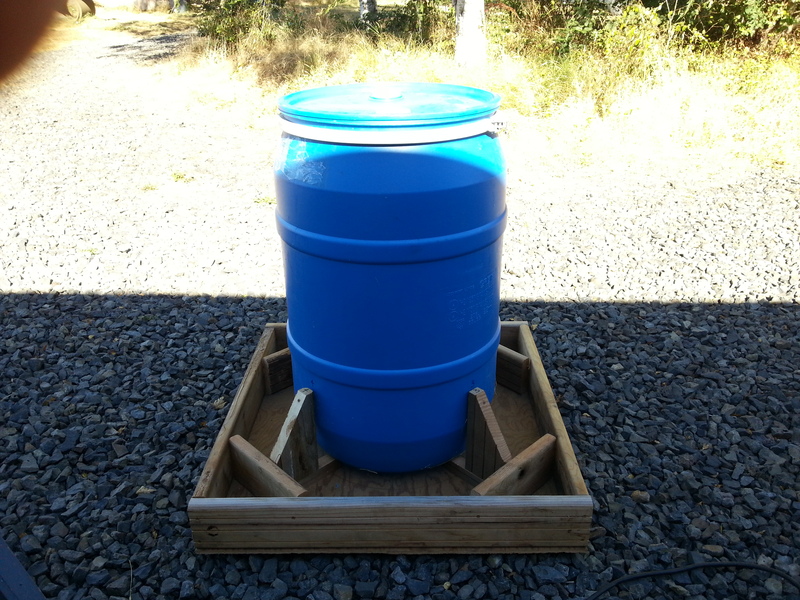 For weaner pigs, I make a slightly smaller version that uses 1/4″ rubber mat, a 30 gallon barrel, and a base that’s 36″ square with 2″ x 4″ sides. Same concept, just smaller and a little easier for the little porkers to use. If you build one of these for your pigs and come up with improvements, I’d love to hear what you did that’s working better. Thx! Follow-up 1/18/2017: How have these feeders held up and what would I do differently now? 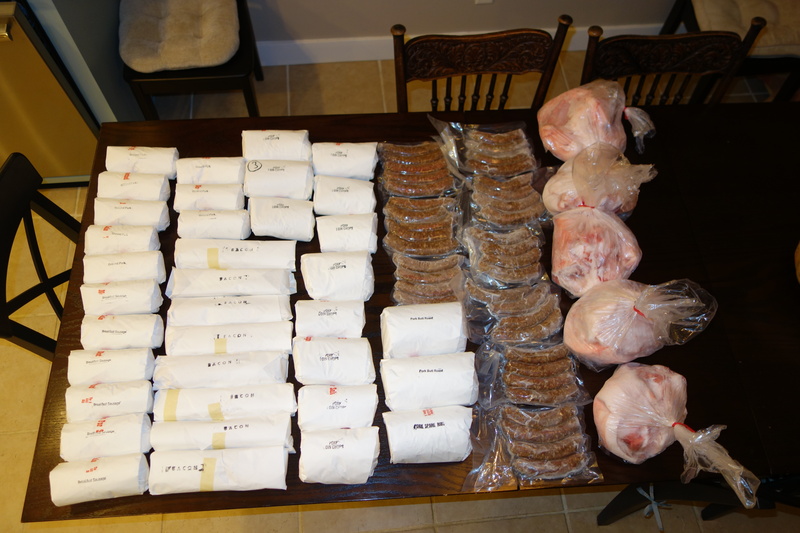 I’ve received some email lately asking questions about the Elkhorn hog feeder design and I realized it’s time to post some follow-up information on materials and design changes. Firstly, let me say that I still think this low-cost feeder design is good for hogs up to 250 lbs. When hogs get any bigger than that, they have difficulty getting their snouts close to the feed, so they push on the barrel and rip the screws out that hold the barrel to the triangle supports. The feeder could be made more resistant to this by replacing the deck screws with through-bolts where the support triangles connect to the feeder. The downside would be that the stress would then be transferred to the screws that hold the triangle supports to the base and the hogs would likely rip the feeder apart at that point instead. To avoid that stress failure, the triangles could be replaced entirely with metal straps that are bent into an L-shape. The straps could be through-bolted to the base and through-bolted to the barrel. I think this would hold up to the hogs pushing on the barrel. Having said that, I haven’t tried it. If you do, please let me know how it goes. I’ve been asked by several people about the rubber mat rain skirt. When I first came up with this idea, I bought rubber mat material that was made from shredded rubber. These are normally used as floor coverings in gyms and horse stalls. They work fine on the floor, but on a hog feeder, they are subjected to the stress of flexing back and forth as the hogs push them up and down to get underneath to the feed. Eventually all of these cracked and fell off the feeders. 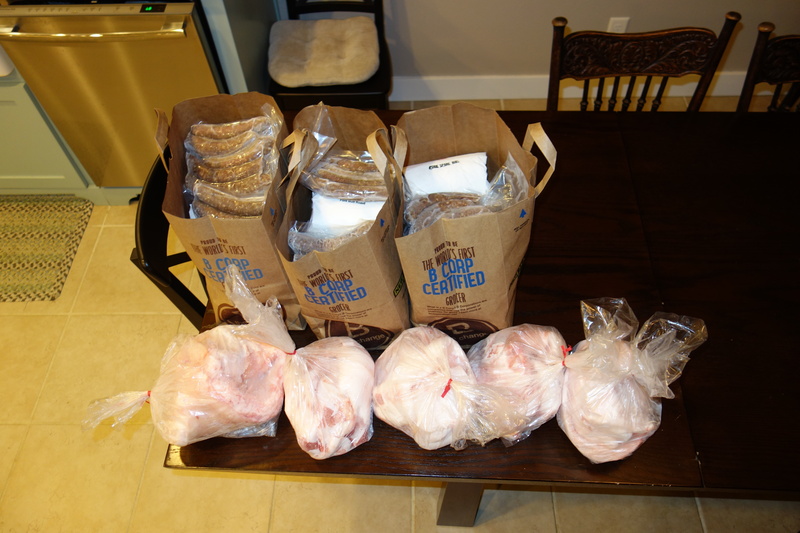 Then I switched to using used conveyor belt material, which is much more resilient. To find it, I Googled “used conveyor belt Oregon” and found a local supplier who cut the pieces to length for me and sold them to me at very low cost. When I got it home, I drilled a hole in it and then used a jigsaw to cut out the center. The other thing about the rain skirt is that it was impossible to seal the gap between the skirt and the barrel. Duct tape didn’t hold up. I tried various types of caulking and that didn’t hold up either. Eventually, I tried making the hole in the skirt smaller so it would be a tighter fit around the barrel. That sort of worked and sort of didn’t. As the fit got tighter, the rain skirt shape distorted and wouldn’t sit flat. It ended up in an inverted U-shape. The effect of that was that the pigs could really only access the feed on two sides. Not terrible, but not ideal either. About the time I reached this point in my feeder experiments, winter was upon me and I had to do something to keep the water out of the feeder. I resorted to t-posts and a tarp over the feeder. I didn’t want to go there because tarps don’t last, especially in high wind. If you go this route, you really need to attach every tarp grommet to a t-post else the wind will rip out the grommets that are attached. I ended up using bungee cords to attached the tarp to the posts, attaching one end of the bungee to a grommet, wrapping the cord around a post, then attaching the other end to the next grommet (one bungee covers two grommets). That worked out well, allowing the tarp to flex in the wind, but not rip. Eventually, I got tired of repairing and modifying these feeders. One thing that happened was that I switched from a pelleted feed to a feed that was ground in a hammermill. 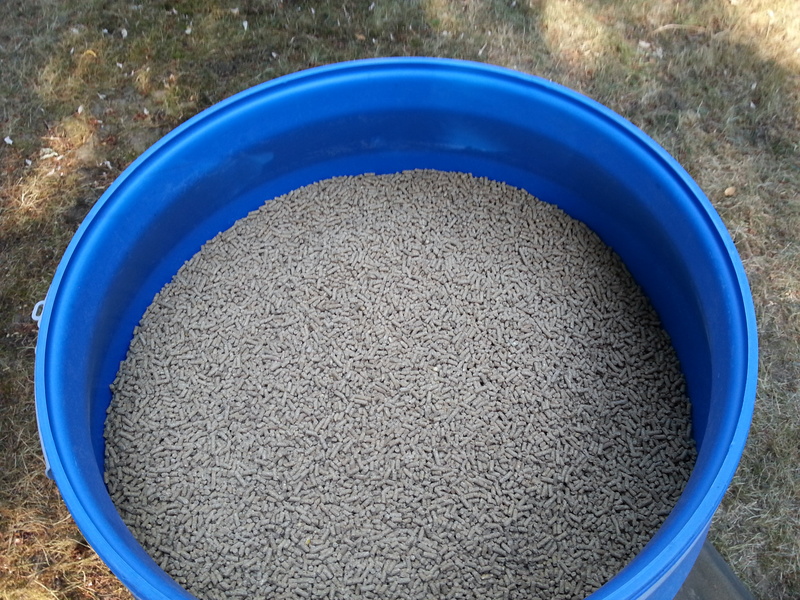 The hammered feed had much smaller particles and that meant that more feed flowed out the bottom of the feeder vs filling the feeder with pellets. 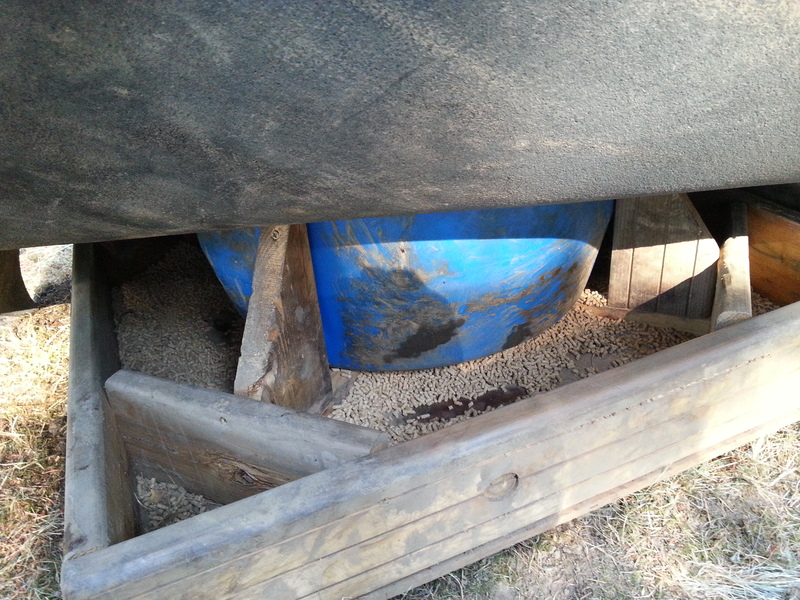 To remedy that problem, I had to take the barrel off the feeder and replace the riser blocks with lower ones. Remember, the original problem where the large hogs couldn’t get their snout close enough to the feed? These lower riser blocks only made that problem worse and it resulted in even more feeder damage. It got to the point where I was repairing about feeder every week. I have two feeders similar to this design. The doors keep the water out. 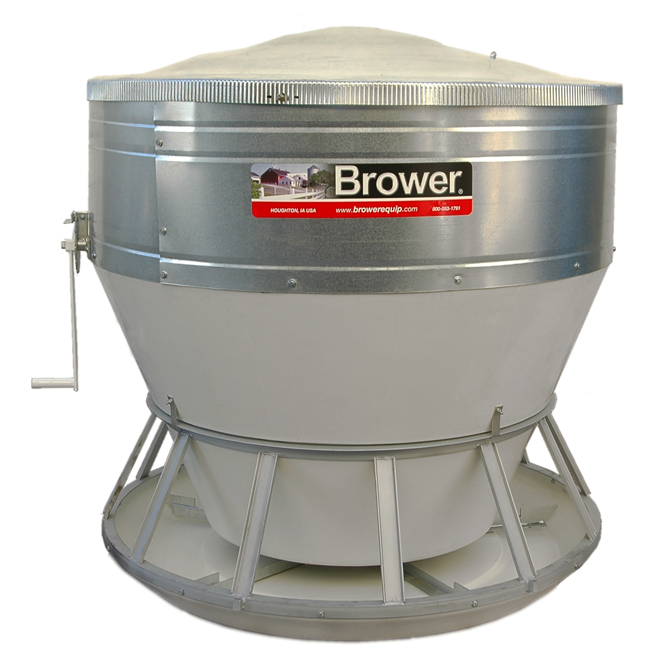 hog feeders for sale ($300 each). They were made of galvanized metal and had doors covering the feed. The feeders were old and had holes rusted through the bottom, but they were quickly and easily patched with bondo. I fixed them up, put them in service, and I haven’t had to repair a single one. I still use the barrel feeders for hogs under 250 lbs and I just use a tarp/t-post cover and don’t mess with the rubber rain skirts any more. One nice thing about the tarp setup is that I attach one side of the tarp to the roof on my hog shelter and then extend the tarp out in front of the shelter as a vestibule. This keeps more rain out of the shelter and provides the hogs with more dry space. I put the barrel feeder under the tarp; the feed stays dry, the hogs stay dry, and everyone is happy. I’ve also been asked how many hogs can use a barrel feeder like this. If the feed is available free-choice (where you fill up the feeder and let the hogs eat whenever they want), I’ve fed up to 12 hogs off of one of these with no problem. There’s really only room for four hogs to eat at a time, so if you feed hogs once/day instead of free choice, there’s going to be fighting at the feeder if you have more than four hogs on it. 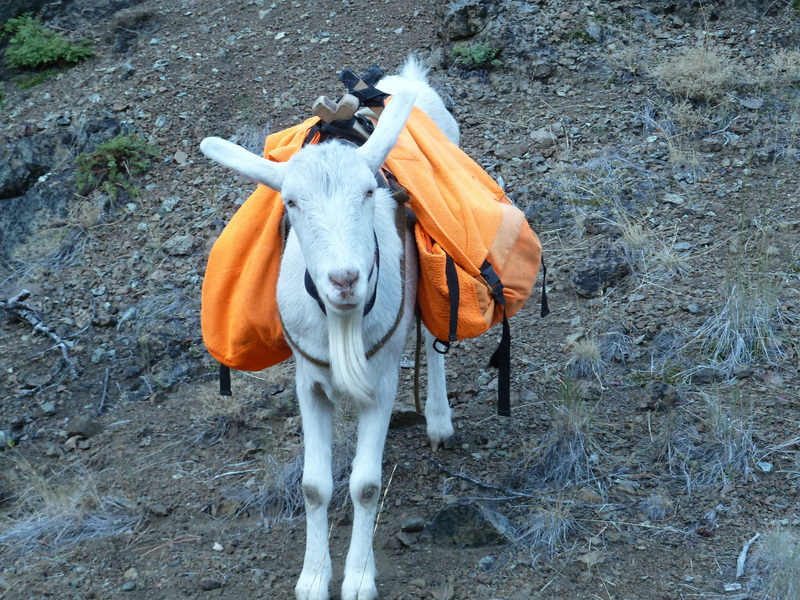 Good luck with your own feeders and let me know how it goes. 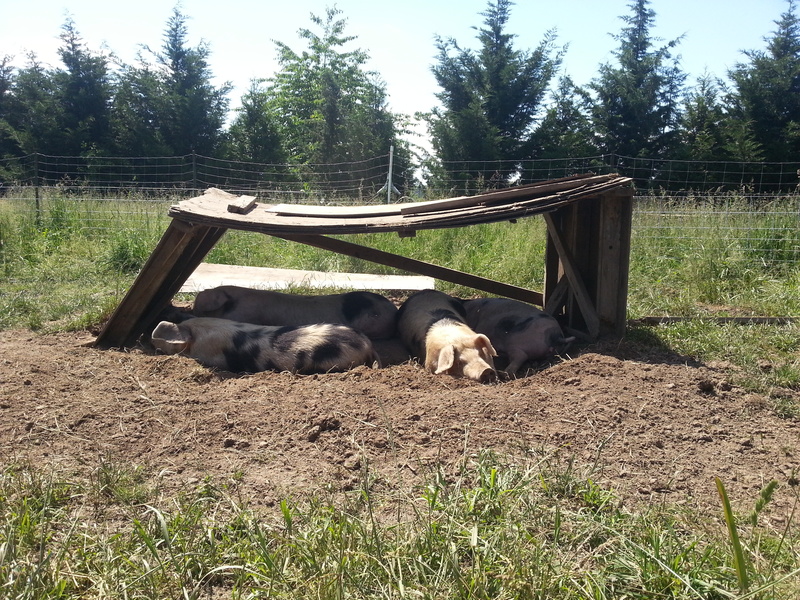 I got up one day last week to find my gilts had decided to demolish their shelter. It used to have plywood on the back and a third support in the center. 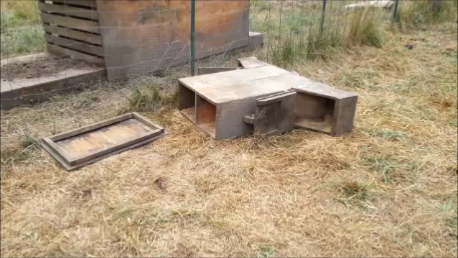 Granted, it was an old shelter, but it had withstood the test of time with eleven goats, so I figured it was stout enough to house four pigs for two weeks. Nope. Unlike goats, pigs like to root around stationary objects, then push and scratch on them relentlessly. 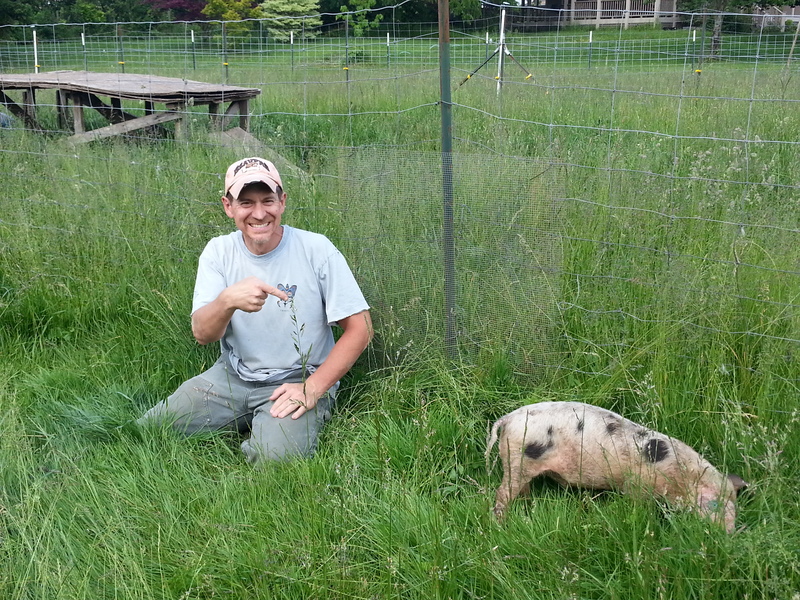 For this reason, pigs were historically used to clear forested fields. The pigs would root around the base of the trees, digging up, chewing on, and killing the roots, then the trees would die and fall over. 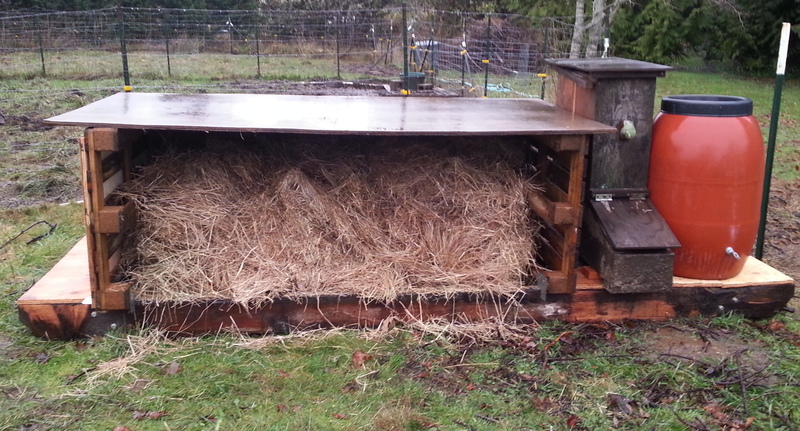 This is my new and improved pig shelter design, built on skids so I can drag it around. 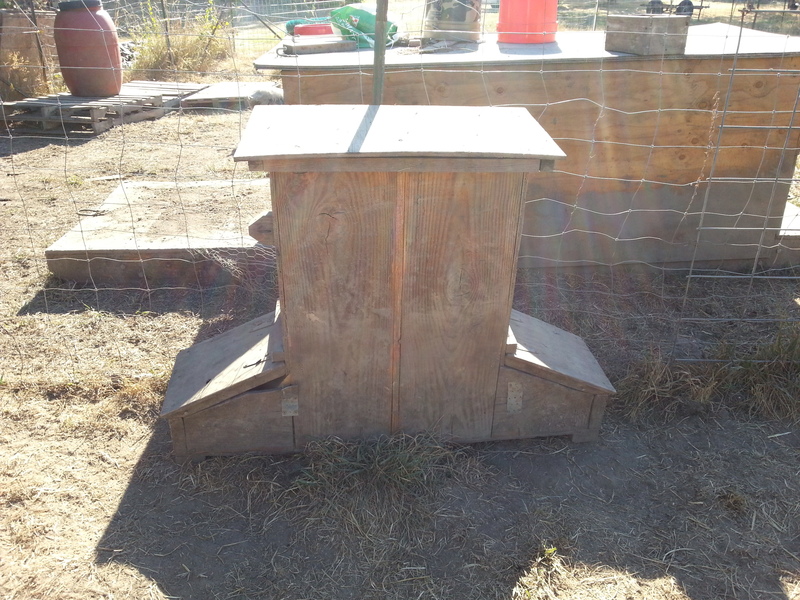 It also has a platform on one end where I can secure both the feeder and the water barrel (I learned the hard way that pigs think it’s funny to push the feeder over and then flip it around until it breaks). This shelter is still standing after five months of pig abuse, so I think the design is pretty good. I use standard pallets for the walls and add plywood across the front in the winter to keep the rain out. Of course, the four gilts that destroyed their shelter last week, haven’t seen this shelter yet, so I may be in for a rude surprise. 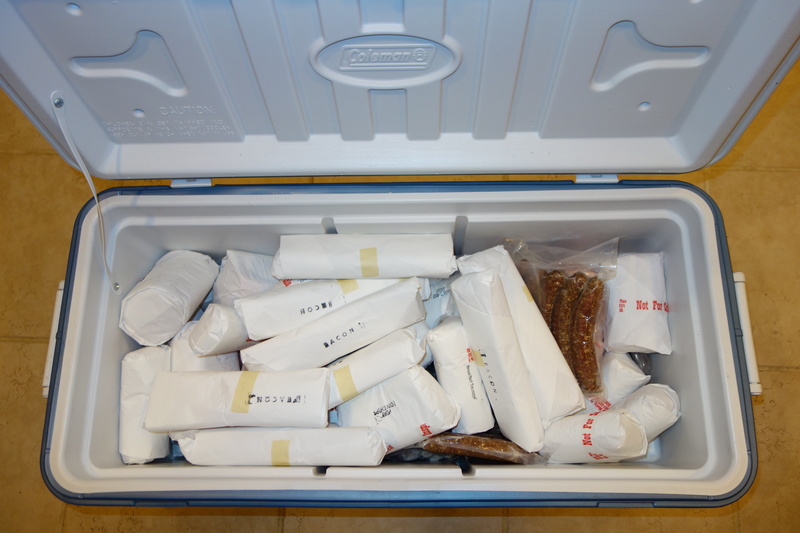 As I was walking away from the pig pasture the other day, I think I heard one of them grunt, “Bring it, fool”….